A positive feedback loop is a situation where two events are mutually reinforcing. With this situation a small change in one input can cause a bigger final increase in both the initial input and the secondary effect. Suppose, there is a rise in demand for buying a commodity. This rise in demand leads to rising prices. However, rising prices can encourage many investors to take interest in the commodity and also buy the commodity. Therefore, the rise in price encourages more demand. 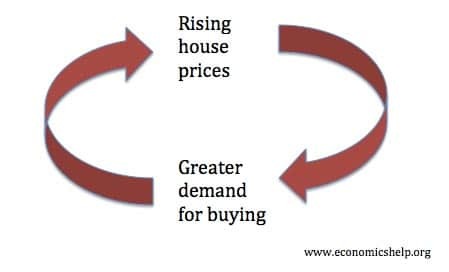 To some extent, we can see a positive feedback loop during a housing boom. If there are factors (e.g. 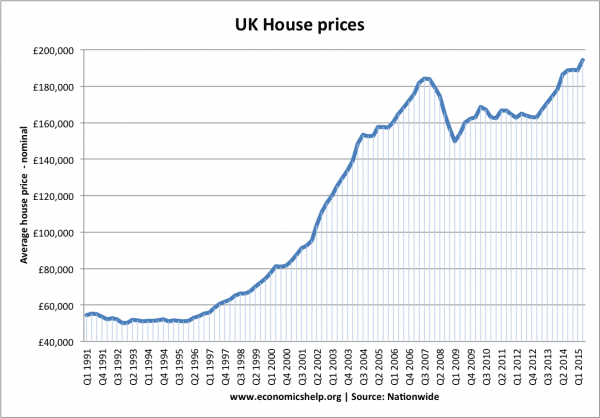 low interest rates, rising incomes) which lead to rise in demand for buying a house, this will push up house prices. A sustained rise in house prices is a factor in encouraging more buy to let investors, who wish to buy a house to gain from the rising house prices. Rising house prices in 1990s and early 2000s, encouraged greater demand for buying a house. This pushed up house price to earnings ratios. We can see this kind of behaviour with many commodity bubbles. From the South Sea Bubble to the Dot Com bubble of the 00s. It requires a particular human psychology – where individuals place high value on prices as a sign of value. There are different concepts to explain how investors can get over-excited by a commodity which rises in value. Herding behaviour – people follow the wisdom of crowds – with rising prices and widespread enthusiasm a sign that it would be good to join the crowd and other investors. Irrational exuberance – the idea investors can get excited by rising prices – forgetting that the value of a stock depends on many more factors than mere past performance. With this kind of positive feedback loop – there is growing instability – if people are attracted to buy because of rising prices, there will come a moment when valuation of the stock changes and people look beyond rising prices to fundamental values. This can cause some investors to sell, and the positive feedback loop start to act in the opposite direction, with sellers causing falling price and falling prices causing more sellers. This is why many commodity booms are often followed by equally dramatic fall. It may sound a contradiction in terms, but positive feedback loops can have a negative impact. A clearer label may be a vicious cycle. This is a very simple feedback loop for a poor developing economy with low GDP. Low GDP means there are little resources for investment. 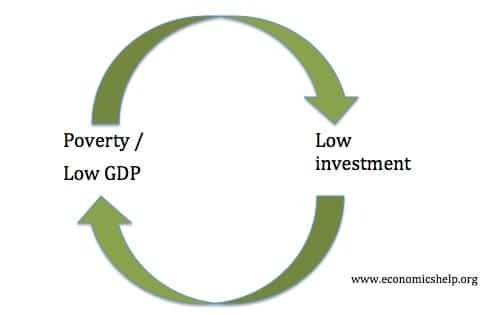 With low investment and lack of education, the economy is stuck with low GDP and poverty. Another example of a positive feedback loop in economics is the multiplier effect. The multiplier effect states an initial injection into the circular flow causes a bigger final increase in real GDP. A rise in injections (e.g. higher government investment) creates jobs and increases real GDP. This increase in real GDP increases profits and incomes enabling more investment. The multiplier effect is only limited by spare capacity and withdrawals, e.g. saving and imports. A network effect occurs when a good becomes more valuable as more people use it. If you get a telephone, then it benefits everyone else, who is already in the telephone network. 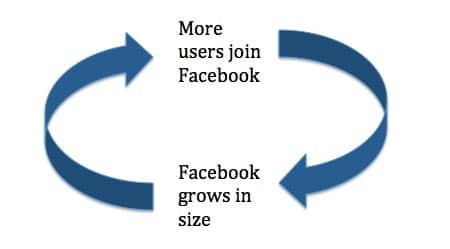 If people join a new social media network, the network grows in size – making it a more useful network. As the network grows in size, it encourages more people to join. In recent decades and centuries, we have seen an explosion in the global human population. Does a rising population cause changes which encourage more population growth? Rising population leads to more potential innovators and improved technology – which enables higher agricultural productivity. Higher agricultural productivity supports a growing human population and enables workers to specialise in other sectors of the economy, such as medicine to improve life expectancy.